Paleo Comfort Foods is a recipe book featuring familiar and appealing dishes for to those following paleo, primal or gluten-free diets. The book starts with a personal introduction from the Mayfields and some basic information about the Paleo Diet. The authors don’t go into great detail about the scientific basis of eating Paleo – because there are tons of other books and websites available that do this they say– but they provide a list of resources where readers can find more information. They emphasize that for them this way of eating is not a diet but a lifestyle that helps them look, feel and perform much better. The focus is on real and unprocessed foods that our ancestors ate, which makes them feel confident they are getting all the vitamins and minerals they need. Generally their daily food includes items such as lean protein, vegetables, fruit, healthy fats, herbs and spices. Foods that are excluded from a Paleo eating plan include grains, legumes, dairy products and sugar. The book includes lists of recommended foods to help you stock your pantry and fridge. Readers are provided with over 125 paleo recipes for old-fashioned homestyle meals, all with full color photographs, for every meal of the day. Basic component recipes are included such as homemade mayonnaise, tarter sauce, peanut sauce and ketchup. Other recipes in the book include Wheat-Free Pumpkin Pancakes, Breakfast Egg Muffins, Pot Roast, Shrimp and ‘Grits,’ Maryland Crab Cakes, Fried Green Tomatoes, Fish Tacos, and Jules’ Banana Pudding and Decadent Chocolate Cake. Grass-fed beef, organic chicken, ground turkey, wild salmon, eggs, deer meat, tomato, spinach, broccoli, peppers, sweet potato, carrots, cucumbers, lettuce, berries, apples, dates, banana, mango, raisins, almond flour, avocado, shredded coconut, coconut oil, grass-fed butter, bittersweet chocolate, honey. The authors mention that they work out about three times a week but don’t provide readers with additional information about how to integrate exercise into a Paleo lifestyle. 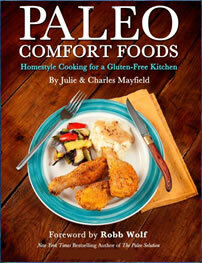 Paleo Comfort Foods: Homestyle Cooking For A Gluten-Free Kitchen retails at $29.95. Can help satisfy cravings for foods not normally allowed on a Paleo Diet. Includes family-friendly meals that everyone will enjoy. Paleo Recipes are suitable for dieters with celiac disease or gluten intolerance. Techniques are simple and do not require cooking experience. Requires elimination of many foods including bread, rice, pasta, legumes and dairy products. Many of the recipes contain ingredients that may be unfamiliar or not available at regular grocery stores. Grocery bills may be more expensive as grass-fed and hormone-free meats generally cost more. Nutrition information is not provided for the paleo recipes. This paleo cookbook offers a variety of paleo recipes for family favorites that are suitable for those following a Paleo Diet as well as anyone with a sensitivity to gluten. It will appeal to anyone who likes to cook and enjoys eating healthy nutritious foods but doesn’t want to completely give up their familiar comfort foods.